One of the most enduring criticisms of rock ‘n’ roll as a whole over the years is that it is a crudely monotonous music; a noisy, rhythmic cacophony designed to appeal to the base impulses of its listeners. We know of course this isn’t true – well… not entirely at least – and that particular condemnation is more an elitist rebuke of rock’s primary audience rather than a critique of the musical attributes of its artists. But while there is far more musical variance contained within rock as a whole than its critics would ever deign to acknowledge – or how else to explain such widely disparate styles as doo wop and hip-hop, punk and funk, Philly soul and Seattle grunge all being key components of rock ‘n’ roll over the years? – the fact remains that most artists stick closely to just one or two attributes rather than sample from all of it. That each artist chooses different attributes is what makes the genre as a whole so eclectic. But what of those artists who attempt to run the stylistic gamut and try their hand at a good deal more than just one or two brands of rock? At what point do they step too far away from their own strengths and start to lose their firm grip on their artistic vision? When does their wildly disparate sounding records begin to frustrate and potentially even alienate their core fan base who want more of what they found so appealing in the past? If each and every release by the same musician sounds as if it was coming from somebody entirely different is that more of an artistic dream or a commercial nightmare? 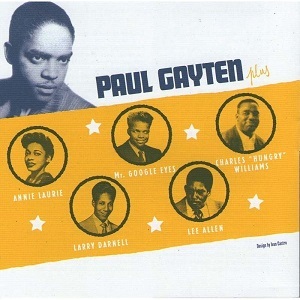 There was arguably no figure who was more multi-talented in 1940’s rock ‘n’ roll than Paul Gayten, but while that at least positioned him to remain relevant should any one area of rock start to recede, it didn’t necessarily guarantee that he’d find equal success in all of his divergent stylistic pursuits. Gayten had first made a name for himself way back in mid-1947 hitting with True, lightweight ballad fare through and through, yet the flip side – Your Hands Ain’t Clean – was rock ‘n’ roll in all but name. In the months that followed he continued to try and bridge the wide stylistic divide by alternating high class and low brow releases, while at the same venturing into jazzier sounds from time to time. He also confounded listeners who’d expected to hear his voice emanating from the speakers by also releasing instrumental sides which featured his piano skills. 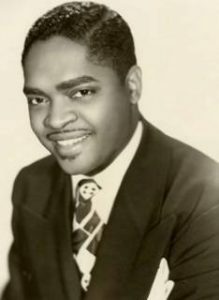 In addition to all of this he was also producing and playing on sides credited to Annie Laurie, a female vocalist who he’d launched to fame around the same time as his own mid-1947 breakthrough by playing on her crossover hit Since I Fell For You. Her records which followed that similarly veered between styles, genres and moods, some of it squarely within the rock realm, while others barely hinted at an association with this seedier side of music. But by now it seemed pretty evident that it wasn’t going to be those older more venerated genres of pop or jazz which gave him his best shot at lasting fame, it was going to be rock ‘n’ roll. He’d recently consolidated his advances in this field by backing Chubby Newsom on her initial hits and then did the same with her husband Eddie Gorman on the regional chart makers he scored in early 1949. His band during the past two years had contained some of the future architects of rock’s sound from guitarist Edgar Blanchard to saxophonist Lee Allen. Blanchard had left to join Dave Bartholomew’s crew (and it’d be Bartholomew who would follow in Gayten’s footsteps as the most successful multi-faceted overseer of New Orleans rock in the ensuing decade), and in his stead stepped Jack Scott on guitar to pick up where Blanchard had left off. All of this pointed quite clearly it would seem to one inescapable conclusion: If Gayten wanted to excel he’d be wise to follow the main rock thoroughfare, the one built on the very basic attributes its critics called… what was it again? Oh yes, “crudely monotonous”. Songs aiming squarely at the sweaty inhabitants of the juke joints on the edge of town, those getting down to the “noisy rhythmic cacophony” artists like Gayten were kicking up to appeal to this audience’s base impulses. Of course he does no such thing on Gayten’s Nightmare. No, to give in to delivering what was now expected from him would be TOO easy. Too calculating. Too unchallenging for an iconoclast like Paul Gayten, a man who seemed bound and determined to show off his versatility and abundant creativity even at the expense of losing his way on the road to stardom. If you were going to unintentionally sabotage your own chances for churning out pleasantly redundant hits then there were worst ways to do it than by striving to come up with something unique. I mean if creativity is your greatest fault as an artist that’s one of the better flaws to have, all things considered. Unfortunately it’s not the attempts at being overly creative that does in Gayten’s Nightmare, but rather the fact that his creativity peters out with his initial concept of the music contained within. For starters this is an instrumental and so as we’ve said countless times you need a memorable hook to make listeners aware of what they’re hearing – since there are no words to do that – and to stick in their minds enough so that they can seek the record out after first hearing it. Gayten does that admirably with the intro which replicates the creeping cartoon-like tension which builds anticipation, whether for the spooky scene that would invariably follow such a lead in on the big screen, or in the confines of a record which should then deliver something suitably chilling immediately after to cement that image in your head. The waltzing progression sets this up perfectly as the horns drop out and a cold-blooded scream rips through the speakers leading to dead silence before Gayten rips off a treble laden solo. But that’s where the original idea simply withers and dies as nothing he plays comes close to matching the initial mood, or even tries to for that matter, despite throwing in more screams along the way which now sound completely out of place since nothing you’ve heard since the opening three seconds calls for such a response. The music is like a patchwork quilt of an indeterminate design. The initial salvo on piano is his attempt to elicit some barrelhouse excitement but it doesn’t build to anything as the best of those do, but rather just provides a brief glimpse of its components while missing one of the most vital – namely the heavy left hand which should form the rhythmic underpinning. Without that it’s missing half the appeal, if not more, and you hope that wherever he takes it next has more of a sensible direction in which to head. 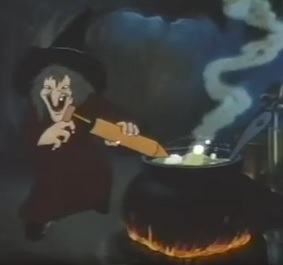 But instead he completely trips you up, as well as himself, by injecting a snippet of the children’s song Frère Jacques into it, followed by a scream, followed by another round of the same familiar nursery rhyme melody and yet another scream. You can’t blame someone for screaming, but you can call into question why they’re screaming in terror when they should be screaming in angry frustration over the realization that Gayten clearly is just improvising this off the cuff, regardless of what the writing credits suggest. It’s oddly credited to King Records producer Henry Glover, as DeLuxe was now under King’s control, and DeLuxe’s own disposed owner David (or Jules) Braun (it doesn’t make clear on the label which of the brothers it was). I say odd because the King Records takeover of DeLuxe is one of the nastier record label disputes in rock to date, as King’s Syd Nathan bought a majority stake in the New Jersey based label and then forcibly wrested full control of it away from the Brauns so that Nathan could get Roy Brown in his own growing stable of stars. DeLuxe would then serve as a long-lasting subsidiary label for King while the Brauns were left to start over by forming Regal Records at the exact time this record was being issued. So the pairing of Glover and one of the Brauns as songwriters (on a song that surely neither of them had anything to with writing) is perplexing to say the least considering the animosity that existed between the two sides. In fact this was Gayten’s final session for DeLuxe (though not his final release) as he followed the Brauns to Regal Records, taking DeLuxe’s resident female vocalist (and Gayten cohort) Annie Laurie with him. Their combined output Regal would be of the same high quality as their work on DeLuxe had been and they’d do just fine, wracking up hits in the coming months and validating their artistic creativity that at times seemed somewhat counterproductive. In the here and now though, on THIS record, Gayten’s creative urges were poorly executed, as this sounds more like a throwaway effort than a legitimate attempt to reach an audience. His piano playing is haphazard by nature, a largely unmelodic compilation of half-formed riffs which are hampered further by being cut short before they can fully come together and give some sense of what they’re trying to accomplish… unless they’re merely trying to mimic a nightmare in their fragmentary construction. When the horns come in it tightens a little but hardly bolsters your impressions, which remain weak and confusing. Only after Lee Allen emerges with a solo, hardly a great one at that, does it begin to take shape and by now we’re halfway through the record. Yet even here his solo wanders too much, never giving us anything we can instantly recall even immediately after it ends, nothing to forcibly assert itself into our consciousness, nothing that sounds well planned or containing any definite intent beyond fulfilling the basic requirement rock instrumentals seem to have for a sax solo. As the horns start to trade back and forth it just disintegrates into chaos again. Maybe that was the point after all. A tongue-in-cheek commentary on the slapdash qualities rock itself often seemed to call for. Maybe Gayten was snidely commenting on the rudimentary aspects of the musical form he was being enlisted to promote. Perhaps he was even delivering a critique on Nathan’s strong-arm tactics involving the Braun siblings and DeLuxe Records which had introduced rock ‘n’ roll to the world and provided an abundance of opportunity for black New Orleans artists who didn’t fit in the jazz world that had been the only other viable option for them in the years prior to this. Or maybe Gayten was just having a bad day. Since obviously we’re without the benefit of having any insight into his mindset at the time we’ll stick with the latter explanation because it seems most relevant when listening to Gayten’s Nightmare, an underwhelming record that had at its core an interesting and slightly experimental nugget of creativity that just never got fleshed out as it should’ve considering the assemblage of talents involved. Had they built upon the idea of mounting suspense capped off by unexpected musical explosions they might’ve had something here – the type of pictorial sonic landscape that would come to fruition years down the road, something able to set a vivid visual scene in the minds of listeners by using only musical cues and atmospheric melodies. Instead Gayten uses the concept merely as a gimmick and not a very substantial one at that. Give him credit for thinking of it, for being stubbornly creative enough to want to explore something as idiosyncratic as this appears to be, but the end results are decidedly lacking and ultimately failed experiments are just that, failures, at least when it comes to assessing their value as individual commercial and artistic entities. 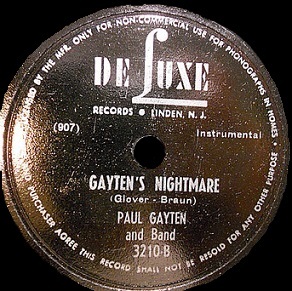 If there was one positive takeaway from Gayten’s Nightmare it might be that it showed how rock artists weren’t all alike in spite of what critics might insist… that their diverse backgrounds and interests and ideas were what made rock ‘n’ roll such a bubbling cauldron of creativity over the years. Even when those experiments didn’t come to fruition it didn’t stop the best of them from trying again. Whether shoring up its deficiencies the next time out or simply heading down an altogether different path, rock artists greatest collective attribute over the years would prove to be the all consuming quest for something new and unique and wholly original with which to build their legend. For Paul Gayten – as well as for David and Jules Braun – that path would find plenty of riches around the next bend and so if this record is the one which marks the end of their relationship with the label which had, in many ways, been largely responsible for this great – and diverse – music called rock ‘n’ roll, well, that’s probably entirely fitting as well. After all most relationships end badly and I guess this is no exception. Leave a reply on "Paul Gayten: “Gayten’s Nightmare”"